Conceived in the back of a Beijing taxi as a ‘quick project' to help establish the 'dumpling feel' and process. That was 3 years ago. The intervening years will make for wonderful Gamasutra reading. 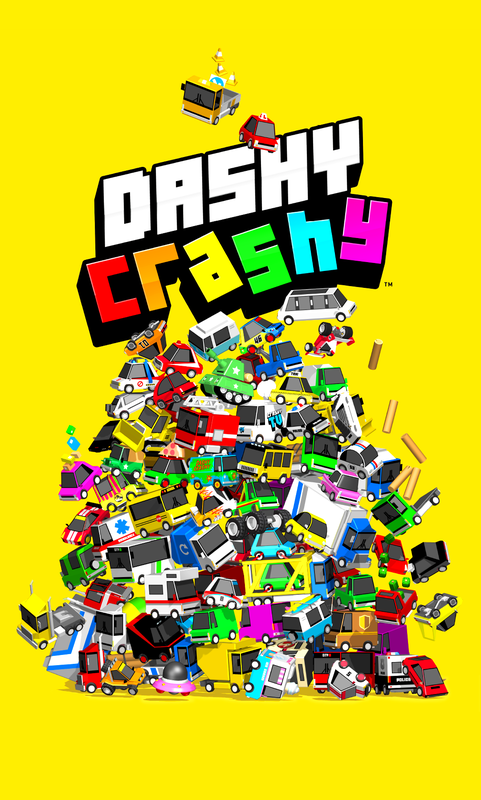 In summary: after a number of stop-start prototyping phases, Dashy Crashy went into full production at the start of 2015. ENDLESS roadtrip, something new every drive. CRAZY crashes, physics driven action. 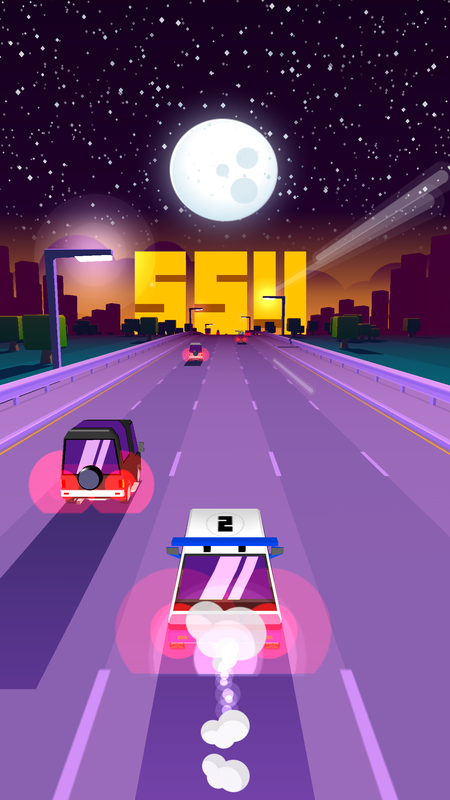 Outrun FRIENDS, win their cars. Visual style inspired by staring at sat-navs while driving around Beijing and a love for SEGA blue skies. Chaotic traffic also inspired by Beijing traffic (the wild frontier! ), and Travis' daily commute down the UK M1 to Rare. Travis: We’re new…ish! Brent and I used to work together at Rare, before that I used to make SEGA games with Sumo-Digtial. We stayed in touch, talked about new games and started working on another game (Dumpling Game#2) before deciding combine our talents into Dumpling (read more about it here). 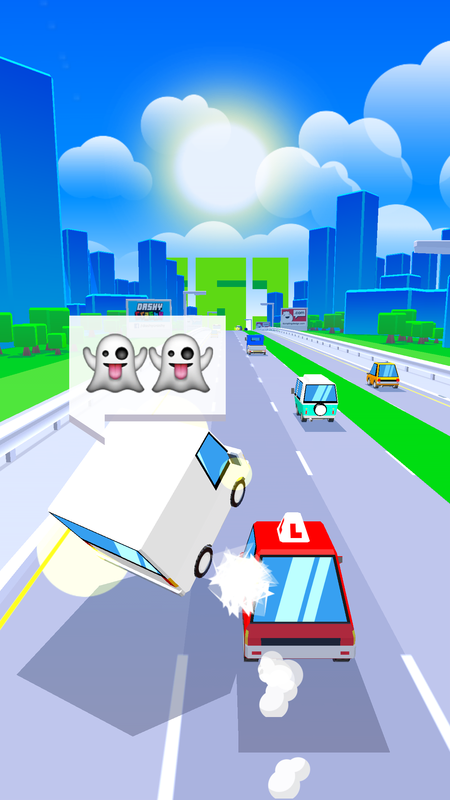 Travis: Dashy Crashy, a game about dangerous driving, luck and reflexes. Perfect for anyone with 30 seconds to spare. Travis: Swipe left and right to change lanes and avoid traffic to get as far as you can before you (inevitably) crash. Simples! Travis: We wanted to give endless games a shot in the arm; making every play a surprise with 'procedural everything’ and dynamic physics-action, while exorcising our love for arcade - making SEGA games specifically - into a pure, distilled form for a new audience. I smell Free to Play? Travis: We’re trying a ‘pay-what-you-want’ approach. 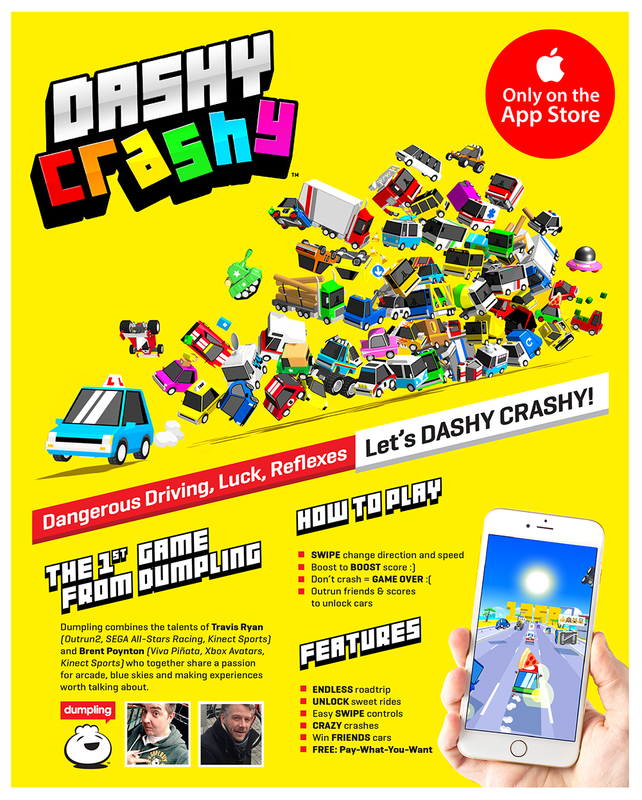 Dashy Crashy is FREE to download with extra plays awarded for watching video ads. Cars cost between $0.99 and $2.99, buying ANY car removes ads forever. All of the cars can be unlocked for FREE via the ‘highway lottery’ system. We feel that’s a neat solution to going ‘premium’; remove ads at a price that’s right for you AND get a car you like as part of the deal. Travis: There’s no prize machine here, the stuff you win appears on the highway as you drive, all linked to score milestones and passing your friends and other players via GameCentre. Think of them as ‘loot drops while you drive'. Wait, you can win cars from friends?? Travis: Absolutely! Get friends to sign into GameCentre, they appear on your highway. 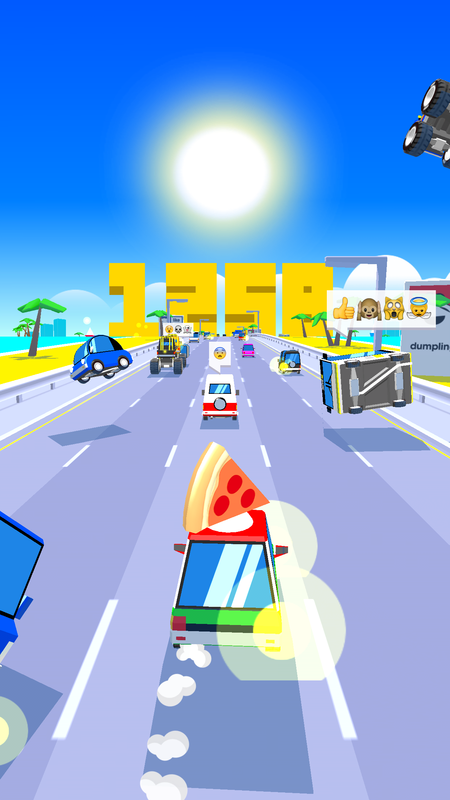 If they’re driving a car you haven’t yet collected, overtake them (at their score) to unlock it for yourself! Do all the cars handle the same? Travis: All of the cars are original designs that fall into one of 4 classes: Light, Medium, Heavy and Fast - each have subtle pros and cons to handling, speed, boost bonus and no. of hits they can take, all balanced to ensure there’s no clear ‘win car’. Blue-skies are back! How’d you achieve the look? Travis: The style is a combination of a bunch of things; low-poly to facilitate high volume of traffic/crashes on-screen. The streamlined, almost abstract scenery is inspired in part by 3D sat-navs and by hyper-colour-palettes of SEGA classics. The visuals - as with traffic and events - are procedurally generated, even we don’t know what we’ll get to see! Travis: We're always tinkering with new content. Watch this space! 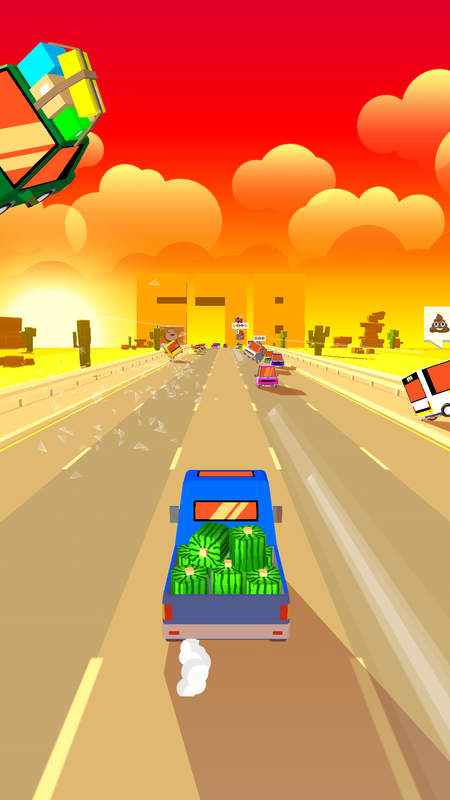 "A bright, brash homage to Sega’s arcade heritage in an utterly compulsive mobile gaming form." "Intensely colourful and breathtakingly fast." 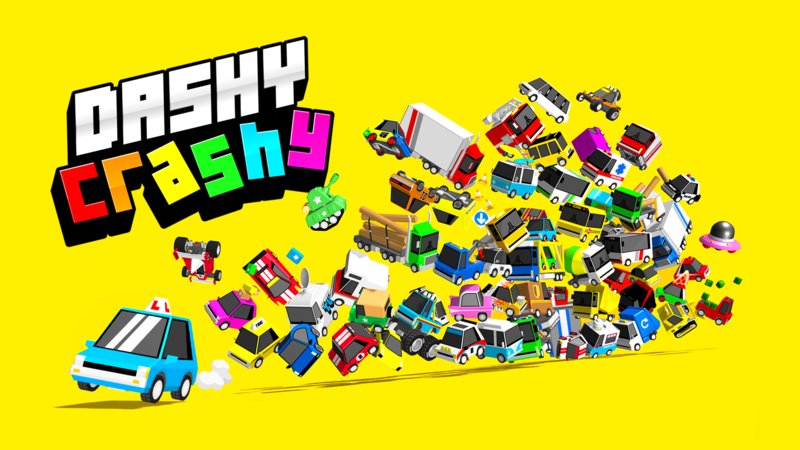 "Dashy Crashy is definitely a game to have on your radar, the way it plays will have many hooked." "It looks like Crossy Road, but going forwards. Did you make Crossy Road? Are you a millionaire?!" Dumpling - as we’re known to our friends - is an independent games studio located in Sheffield, UK. We specialise in making smart little mobile games that pack a big punch; that means fun, casual, social games that are good to play with. Dumpling combines the award-winning talents of Travis Ryan (Outrun2, SEGA All-Stars, Kinect Sports) and Brent Poynton (Viva Piñata, Xbox Avatars, Kinect Sports) who together share a passion for arcade, blue skies and making experiences worth talking about. More information on Dumpling Design, our logo & relevant media are available here.